This election season is, without a doubt, a historic one. Whether you vote for the underdog or the running favorite you have to admit that, at least this year, the choice is yours to make. Eight years ago, you had to choose between an uncharismatic, scandalized-by-association, pro-Chinese carpetbagger who claimed he helped create the internet or George W. Bush – aka W. Four years ago you had the pick o' the litter between a washed up, this-is-the-best-we-can-offer, do-nothing Senator from Massachusetts who likes to refer to himself as John F. Kerry (get it? JFK) or W. Not very encouraging – that is - if you voted at all. Oliver Stone's new movie W. blithely claims that it's "Based On a True Story". At the time of this writing, it's not entirely clear whether he had inside access or not. Regardless, Stone has hit a homerun with his movie by ably capturing the subtle nuances – fiction or not – of the relationships between the characters, and how they individually and collectively contributed to the current state of affairs in U.S. foreign policy. At face value, the movie can easily be construed as mere satire. Funny moments abound in the film, but it never strays too far from its deftly drawn line of the dramatic prime. Stone takes us, through the amazing metamorphic powers of Josh Brolin, on an incredible fly-on-the-wall journey to when Yale frat boy George Bush transformed into W. This is made most evident when George comes home one night from a drunken binge to confront his hard-nosed father. All the feelings of inadequacy and regret that sons often feel toward their father come erupting to the surface in this riveting scene. The capstone scenes are found in George's conversion to Christianity. The filmmakers could have very easily fallen on the old hat of portraying some brainwashing demagogue "saving" young George's soul, but they were surprisingly equitable and even candid about the subject matter. This is no satire, it's biography. 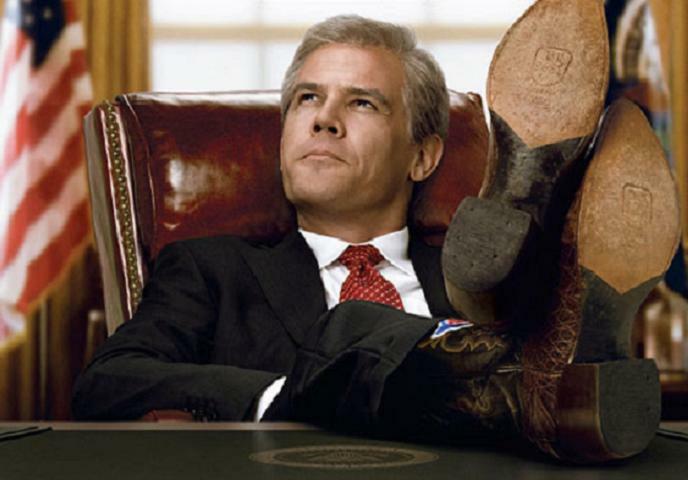 Enough can't be said about Brolin's portrayal of our 43rd President. He not only captures the youthful angst that we can only imagine that he felt growing up a Bush, but he is a veritable doppelganger when treading the hallowed halls of American power. And, with few exceptions, his ensemble supporting cast are a great compliment. The film felt somewhat short because it doesn't cover his second term. It was probably cut for time constraints, but knowing Oliver Stone he probably has a four hour director's cut somewhere. I was also disappointed with Thandie Newton's portrayal of then National Security Advisor Condoleezza Rice. She should have gone for less mimicry and more channeling. Every time she said something it was unintentionally comical. I recommend this film to anyone interested in seeing a portrayal of a man who would be President. If your only interest in W. is for his comic relief then this movie's not for you. If you sometimes find yourself wondering, "What was he thinking?" then you may garner some insight from the film. Remember, it's based on a true story.